The day began with rain but I had determined the day before that this would be the day to take the longest paved trail on the map. It was 3.5 miles out to the end with some small circular trails that would certainly call my name. With umbrella in hand after breakfast I took off. Having a step counter on my waist really motivates me to keep on moving. However, on rain forest trails it's impossible to move fast since there is so much to see ... you have to stroll and enjoy ... unless you're on a trail you really want to get off, like my swamp hike trail. I saw Howler Monkeys as I began the trail and a lizard about a mile further, but with the rain, there wasn't much activity. I took one of the map turnoffs that showed a bridge crossing the large river. I've enjoyed taking photographs of the various bridges on the trails and truly delight in walking over the long one by my cabin that goes to the dining hall. It's like a canopy walk on both ends so you can always find something to watch. I wondered what kind of bridge they would have off this trail to cross the same river much further downstream. What a surprise when I turned a corner and saw the "bridge." 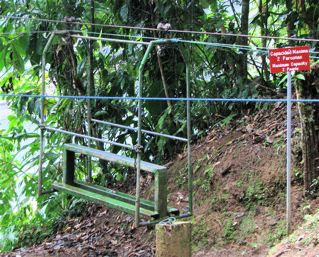 It had a capacity of two people and you stood on steel posts and used ropes to get yourself across. Where's my honey when I need him!? When I told him about it he said he would've happily been my gondolier. I told myself that holding the umbrella in one hand to keep my camera and me dry would make it impossible to maneuver this "manually-operated" bridge, but in reality ... there was no way I would've used that bridge alone. It would've been a grand adventure to do it with Randal. Oh well ... next time. Although I was pretty much staying on the main trail, I continually had my map in and out looking to see how far down the trail I was. At some point with juggling the umbrella, my "gear" and the map, I must have missed the pouch. I discovered this as I passed the 3-mile marker and began looking for it to see where a side trail went. Surely it would've simply dropped on to the concrete trail .. so I turned about and headed back at a faster pace. By the time I got a mile down the trail I was at a turnoff where I knew I had pulled out the map before. So ... I had not found it retracing my steps. LOST! One special map! I had carried that with me on every trail and marked the dates when I took each trail and some landmarks to remember. It was well worn but very much representative of my walks, so it was a sad moment. At least the rain had stopped and I was soon busy with photos. I heard a bird that sounded like it was hitting stones together. Brightly colored white, yellow, and black with red legs and feet. It was deep in the forest so my photos are not very clear but my memory is. It was a White-collared Manakin. 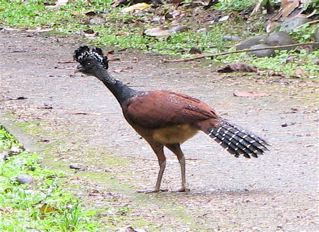 I came upon a pair of Great Curassows and was delighted to get a good photo of the female that was on a well-lit part of the trail. My two other encounters were in poor lighting. This bird is 36 inches long so it's quite a beautiful sight to see. They wander in and out of the forest so you never know when one will appear on a trail or behind my cabin where I've had males wandering twice. I was hoping that somebody had picked up my map and turned it in at Reception, although as worn and wet as it was, it would easily be considered trash. The hope kept me enjoying the return walk, knowing that this day was going to produce the most steps I'd walked since I arrived in Costa Rica. I finished off the day with over 9 miles. I've been so excited at the amount of strength and energy I've had here. The other treasure of my rainy day walk was to come upon a group of Green and Black Poison Frogs. There were 3 of them and I noticed how they all had different patterns. It's amazing how small these frogs are. 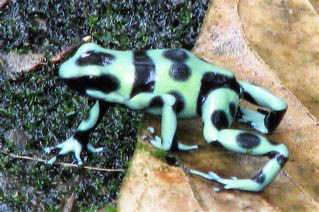 With all the color it makes them look so large, but Poison Dart Frogs are tiny little things less than an inch long. On the way to dinner I checked to see if anybody had turned in my map and didn't get the answer I desired. I shrugged and decided to do as my Daddy used to tell me, "let it roll off you like water off a duck's back." It's taken me way too many years to begin taking that advice. At least I hadn't lost anything really important! I was distracted away from thinking about the map as I crossed the bridge and saw a beautiful bird with a very long tail. The colors were beautiful and it was close enough to get some good photos. 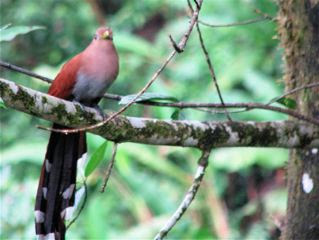 When I looked it up in the bird guide I discovered it was a Squirrel Cuckoo. What an odd name I thought, but some research for an article on the bird told me how it got its name. Since I arrived I've been concerned about leaving my room key in the room when I cross the hall to use the bathroom. It's not wise to leave the door open for uninvited guest, so I'm careful to pull it closed. I check and recheck my pocket before passing through the door, but the challenging time is when I have a nightshirt on with no pockets. 16 days into my stay and I'd never left the key inside. Until this evening! I got something messy on my hands and headed out to wash it off pulling the room door a bit too strongly and the instant it clicked in the latch I knew I was LOCKED OUT! I never did bother to find out what to do if such a thing happened. Reception closed at 7. It was 8:30. All I could hope for is to find somebody that knew something. I washed my hands and knew I would need to borrow a flashlight. I had heard some noise on the second floor just moments before, so I went up the stairs and began knocking on all three doors. Somebody replied in one of them and opened the door. I told her the problem and asked to borrow a flashlight but she said to use the telephone. I had seen one on the landing between our floors but never knew what it was for. Fortunately she did and spoke great Spanish also. She called and explained the problem. After a half hour of strolling up and down the sidewalk with my "Good NIght Alaska" nightshirt on, a guard came with a key. What a wonderful feeling! My mind had imagined many different scenarios of which none would've been pleasant. What a day! Although the Swamp Hike was my greatest challenge during my stay, this day was certainly a challenge in its own way by losing my map and getting locked out. I do keep my guardian angels busy.